This place is hideously-overpriced for both drinks & food, which I could accept on the few occasions I use the coach station. BUT... having paid £5.05 for Old Rosie cider, & then found that the men's cubicles are a STILL a disgrace, & have been for the past 40 years or so of my acquaitanceship, I thought something should be said! The same grafitti, the same broken loo-roll holders, piss all over the floor, etc, etc, etc- & this is central Victoria! When I pointed this out to the manageress, she said she'd been at the pub for 21 years, as if that was some sort of excuse/justification/reason for being tight-fisted about maintenance. I've nothing more to add. Popped in for a pint at 1030am while waiting for my coach. London pride in good condition and no complaints at all, which is unusual for a grumpy sod like me. Staff polite and friendly, toilet reasonably clean. Pub pretty empty on this rainy Wednesday morning which was nice for me. About 8 people in there. Music was ok for me, playing Bowie and reasonable volume that wouldn't interferer with conversation. I'll be going back for a pint of my next trip. Pride was £4.25 which is about £1.25 more than I pay in my local, but it is SW1 so expected. Food too expensive for me. I think the Cod and chips was around £11. Burgers over £6. Too rich for me. Generally really friendly nice pub though to be honest today the duty manager who is only three months into the job caused my mum a bit of Agro when she asked for the key to the loo saying she had to buy something (yes we always do) and that she had t said please (she did as an oap would) . 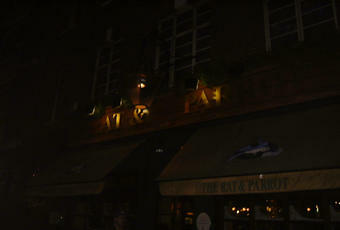 We always use this pub, the Guinness is very good and Olaf does a nice shamrock on top. C wasn't forthcoming with a receipt which as Duty Manager was surprising. She was polite but unhelpful. Only downside of this pub on this particular day. Generally excellent. There is no question that this is a by-numbers definition of averageness; neither the building nor its contents are especially inviting and are not conducive to the creation of any memorable character. The decor is bland, although in reasonable order; the ales are ubiquitous though reasonably well-kept; the food is predictable and microwave-based but arguably better than the standard set by many Wetherspoons' kitchens; the service fairly impersonal but efficient enough. This is a classic "convenience" pub; a place where one would never set out deliberately to visit but when in need of basic sustenance in the form of beer and burgers and there is no obvious outlet nearby where higher quality can be guaranteed, it will do the job to an acceptable level. It's surely its prominent location near to Victoria Coach Station that has secured its viability thus far, although it was hardly thronging on my visit last night. 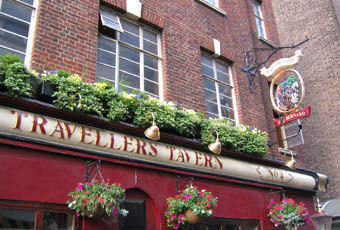 If only for the reason that far too many London pubs are closing regardless of their quality, I do hope that the Travellers Tavern doesn't allow itself to become another statistic. A bog-standard pub is better than none at all.